This week's Free GM Resource is a set of interesting product previews from Raging Swan Press. Although intended specifically for Pathfinder, the GM Miscellany Series are hearty GM aides that really flesh out small locales/dungeons that GMs can pretty much drops right into their campaigns. Usually free previews like these are little more than an example of the writing and layout that really have no value on their own and are just intended to entice you to pick up the full product. What Raging Swan Press has done is actually put out some useful free content that would entice you to purchase the rest of the product. 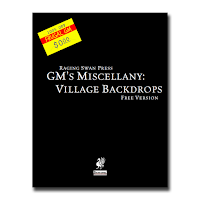 For example, the GM Miscellany: Village Backdrops is a 98 page PDF while the free preview is 34 pages. Instead of just putting out a few pages of free preview, what the publisher did was actually provide the 1st 2 pages of content for each of the 12 featured villages. You get a quick background, demographics, notable information and even a map! Sure it is written for Pathfinder, but there isn't all that much Patherfinder-specific "stuff" to get in the way. 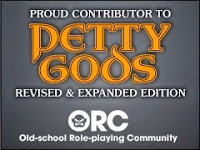 I'm planning on picking up something from the GM's Miscellany line to review this week.